Heat oven to 375°F. Cook bacon as desired until crisp. Drain on paper towel; crumble bacon and set aside. Unroll both cans of dough; separate into 16 triangles. On ungreased large cookie sheet, arrange triangles with shortest sides toward center, overlapping in wreath shape and leaving 4-inch round circle open in center (see diagram). Crescent dough points may overlap edge of cookie sheet. Press overlapping dough to flatten. Spread cream cheese spread on dough to within 1 inch of points. In small bowl, mix crumbled bacon, broccoli and bell pepper; spoon onto widest part of dough. 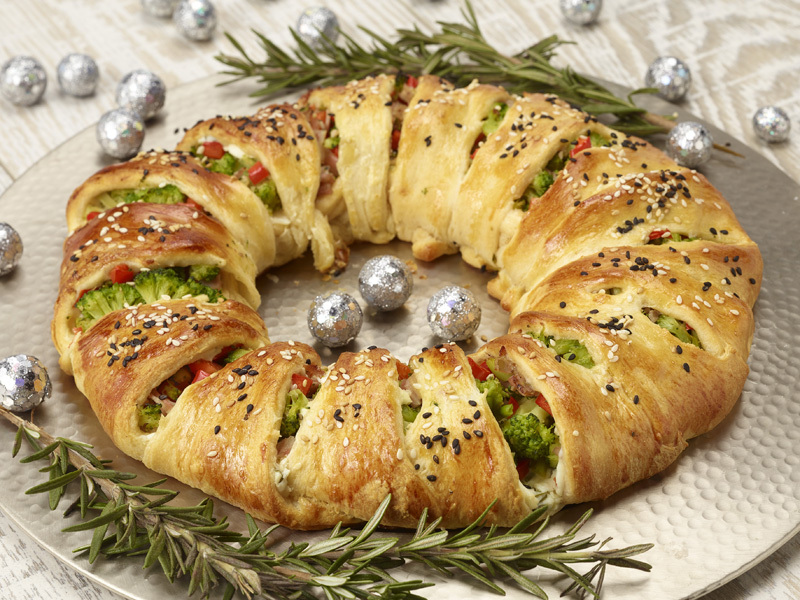 Pull end points of triangles over broccoli mixture and tuck under dough to form ring (filling will be visible). Carefully brush dough with beaten egg; sprinkle with sesame seed. Bake 25 to 30 minutes or until deep golden brown. Cool 5 minutes. With broad spatula, carefully loosen wreath from cookie sheet; slide onto serving platter. Garnish with fresh rosemary. Serve warm. Store in refrigerator.